whan he announced last october the beginning of his new mystery KAL : the doodler for november… I LOVED the video !!! I had the song stuck in my head for days and days… ‘Cause Baby you’re a knitter, all over Ravelry and Twitter… Make your needles knit, knit, purl… Don’t thank me if you have it too now ! 🙂 At that time, I knew that it was the best way to try one of his patterns. As I didn’t have yarn in my stash to knit it and as I was still a bit afraid, I waited before buying the pattern. 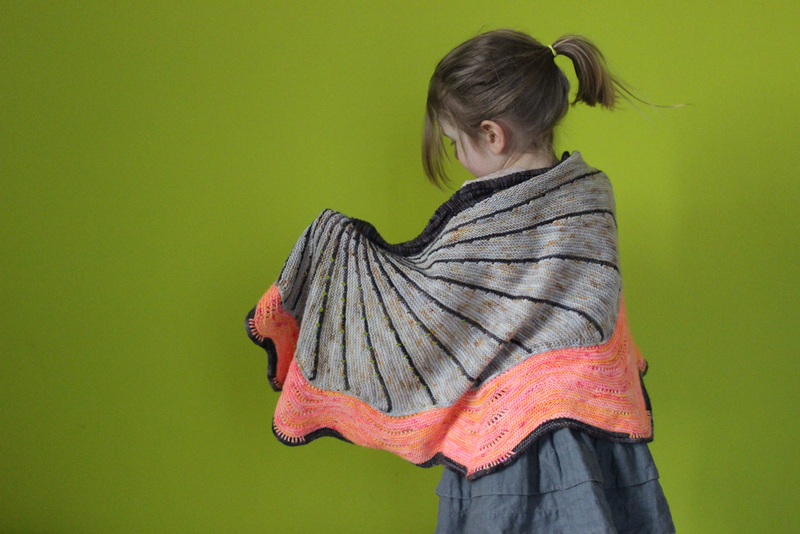 I prefered stalking the first clues on Instagram… When I saw that butterfly wing, I kew I had to knit it ! I kept looking for the different projects appearing on my feed, noting the coulour combinations I liked the best, decided to buy the perfect yarn for it during my time at Creations & Savoir-faire craft fair in november. And that is precisely what I did on the very first day I attended it ! I went to L’OisveThé booth and catch 3 skeins of La Bien aimee before they all went into other visitors bags… I knew I wanted some kind of neutral base, that’s why I chose Undergrowth and Driftwood graffiti. But I wanted a pepsy colourway too, and that’s when Tang jumped in my bag ! Back from CSF, a lot of other projects went first on my needles before my Doodler. I must says that, as a knitwear designer, I have some difficulties to knit patterns that are not mine, even if I did decide to knit more for myself this year. With 2 young kids at home, my knitting time is a bit on the short side and I rather prefer working on one of my design, to be sure to have enough patterns to publish in the next months, or on knits for my kids, so htey have something to wear, than working on some “selfish” knits for myself only. In February, holidays coming by, I had to choose one project to bring with me, I decided to crave in and knit for myself ! Of course, it was time for Doodler and those 3 skeins of La Bien Aimée ! From the moment I casted on, I had really big troubles to pt it down. It was so addictive ! I LOVED seeing the butterfly wing expand (so beautiful !) and the cable was really fun to work. My only hesitation : Tang ! When I had to begin clue 3 with the 3rd colourway, I had lots of doubts. Tang appeared so flashy (a bit too much ?) ! I weighed pros and cons to keep going with it, elaborating different options to attenuate the fluo effect and anchor it with the other colours (for example with one wedge in Undergrowth), but finally I kept going and I knitted 4 wedges without thinking ! In the end, I’m so glad I knitted this new shawl and I won’t be scared anymore to knit one of Stephen pattern : you just have to choose coulours that suit you ! And if that’s possible, I felt in love even more with Tang once knitted. Yes ! It’s flashy ! but very springy too ! And i find it makes me look good ! “Doodler ! Doodler ! It’s my first Westknits shawl ! I REAL-LY loved KNIT-TING it !